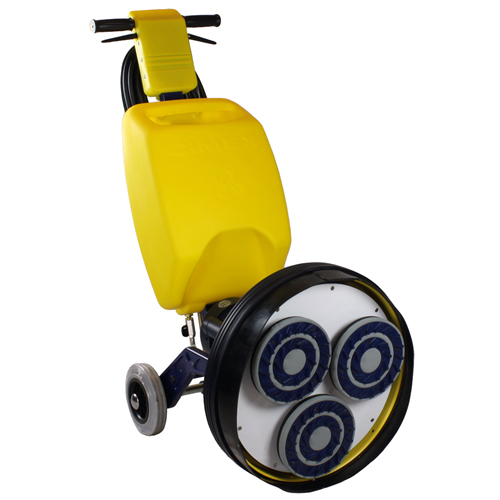 The Cimex Diamond Finisher is suitable for concrete, marble, granite, terrazzo and stone floors. This machine is an easy alternative to conventional methods and will get the job done quicker. The Cimex Diamond Finisher comes equipt with a three-headed, counter rotating system. Choose which diamond faced finishing discs fits with your unique floor and attach it to the machine. We offer discs that range from fine to course, to ensure your new or old floors are accommodated. This machine comes standard with a 6.6 gallon tank for longer use without having to stop for refills. The design on this machine ensures quality control and maximum down pressure. Other features include a forward and reverse function for a more detailed finish.